After one year or so without a notebook I decide the time to buy a new one is arrived. I’ve to say that I didn’t remember how difficult is to find a decent laptop, 99.999999 % of them are crap. Quite everyone have a damn glossy monitor, a completly useless DVD drive (good only to make the weight grow) and no E-Sata port. Other than that you can add that 85 % of them are also made with very poor materials, superthin plastic case and a very annoying flexible keyboard. After some days of googling I came up on the Lenovo site, the site itself could be better but their notebooks are exactly what I’m looking for. 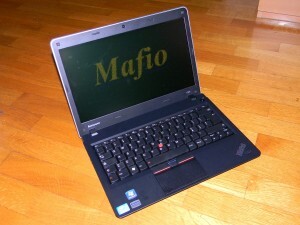 The name is different, Lenovo instead of IBM, but building quality is still exactly the same. So I bought a Lenovo Thinkpad E320, a nice 650 € 13″ machine equiped with Sandy Bridge i3-2310M, 7200 rpm HDD, 4 GB of DDR3, E-Sata, 3 USB 2.0, UMTS module, matt display and 6 cell battery. First thing I did when I had it in my hands was: take out the HDD, attach it to my desktop PC and make a full backup. I searched for some information about warranty but can’t find anything sure about it, so better to have a backup to restore in case something go wrong and I need to RMA it. If there is something I don’t like is the HDD, ok, it’s a 7200 rpm one and I must say it’s quite fast but have a downside: 0.7 cm thickness. Probably would be a PITA to find an SSD so thick. After the backup I plugged in an USB drive and reinstalled Windows because OEM are usual to install every kind of garbage they can on the preinstalled OS. Thanks God the Lenovo site have a quite well done driver/software download section where everything about their notebook can be found. The first days I took it to university quite every guys I know told me I had to install ubuntu…and that made me laugh quite alot. I’m the first to say that for the majority of the enterprise tasks a Linux distro will serve you better than a Windows based system and I also use it when I think it’s better. …but for the day to day usage Windows is much much much better. When I need to use my notebook or my PC I need something where the things work without need to open a terminal and google for the commands for this or that program. For the sceptic guys I would like to tell you my experience and what I saw in the past years. There is quite no difference from Linux and Apple guys: they both think they are better and their OS/stuff is the best for everyone and everything. Those guys are divided in 2 category: the ones who know nothing about IT but like to be different from the others then use strange OS/buy fancy Apple stuff and guys that I call ‘virtualizzatori folli’ (you can translate it with ‘crazy virtualizers’). Those guys, that sometimes are professors, are supposed to know something about informatics but spend 90% of their time in a virtualized Windows XP environment hosted by VMware on their fancy 2k € Mac Book Pro. I also saw many of them having video encoder and other CPU intensive stuff (3Ds max and so on) installed on the virtualized XP 32bit. Quite often those guys that talk about how secure and fast OSX or Ubuntu are compared to a Windows based system are the same who use a 10 years old discontinued OS (XP) in a close source, shareware, virtualized environment (VMware workstation). In my opinion those Linux distros “specifically build for desktop environment” are a completly meaningless forcing of something that was not built for that.